The tragic loss of the Concorde on 25 July 2000 at Charles de Gaulle in Paris serves as a dramatic reminder of just how dangerous foreign objects on the runway can be. The crash cost the lives of 113 people. True, accidents on this scale are rare, but foreign objects on the runway regularly result in significant material damage. An important step in making international air travel safer: Rheinmetall’s DEB-RA foreign object detection system is now eligible for procurement under the US Federal Aviation Authority’s Airport Improvement Programme. The FAA recently issued a special permit authorizing purchase of the world’s most advanced system for detecting foreign object debris at airports. “Buy American” regulations actually specify the procurement of US products for the Airport Improvement Programme, or AIP. Under certain circumstances, however, the FAA can issue an exception to policy, which is what happened here. Some 60% of DEB-RA components are American made, and final assembly also takes place in the United States. Granting of this special permit enables swift procurement of the DEB-RA in AIP projects without the need for further waivers. Furthermore, allocated funds can be quickly disbursed to manufacturers that meet the Buy American criteria. Rheinmetall’s state-of-the-art DEB-RA employs millimetre wave radar in combination with high-resolution electro-optical sensors in order to detect dangerous foreign objects on the runway in real time. This reduces the risk posed by these objects – and with a very low error rate. A further advantage: DEB-RA can be used as an airport control system for vehicles and aircraft on the ground (Advanced Surface Movement Guidance and Control System / ASMGCS). 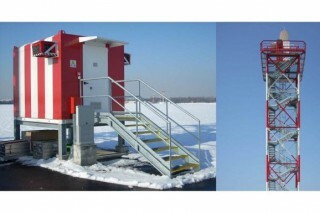 In this capacity, it can either supplement or replace existing equipment, or serve as a standalone system – regardless of the composition of the runway or the sensor configuration. Here, too, disasters such as the collision in Milan-Linate on 8 October 2001, which left 118 persons dead, show how important it is to have reliable technology.